Hyatt Investigations & Process Service, LLC is a professional private investigation agency based in Lake Charles, Louisiana that provides confidential, expedient and cost effective services to attorneys, corporations, small businesses and the general public throughout the State of Louisiana. Hyatt Investigations & Process Service, LLC specializes in surveillance for all manners of domestic and child custody issues, Personal Injury Investigations and Hard to Server Process Service. Using the latest in state-of-the art video and photographic equipment, our licensed Louisiana Private Investigators have the knowledge and experience to conduct surveillance operations throughout the state of Louisiana. 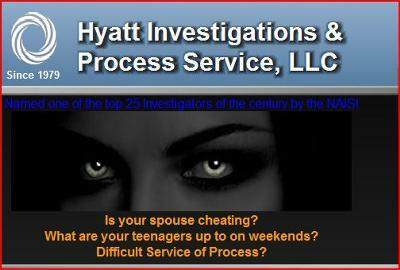 Hyatt Investigations & Process Service, LLC are also experts in conducting background investigations on romantic partners and significant others, witness locating, courthouse searches and public records retrieval. Remember your Peace of Mind is knowing all the Facts. "Your peace of mind is knowing all the facts"
Lake Charles, Lafayette, Crowley, Deridder, Leesville, Ragley, Iowa, Jennings, Baton Rouge, New Orleans, Westlake, Alexandria, Sulphur, Monroe, Kinder, Lake Charles, Vinton, Oakdale, Oberlin, Moss Bluff, Shreveport, Calcasieu Parish, Cameron, Allen, Beauregard, Jeff Davis, Statewide & Nationwide Process Servers Available!